Bedtime for Frances is one of the most adorable children’s stories I know. 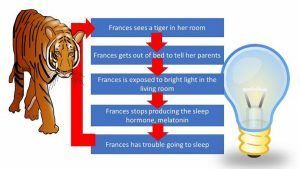 In it, little Frances finds all sorts of reasons to avoid going to sleep. She needs a glass of milk. She forgot to brush her teeth. There’s a tiger in her room. What her parents, and perhaps the author, don’t know, however, is that these “curtain calls” will make it harder for her to go to sleep. That’s because when she goes into the living room, she will be exposed to bright light. Bright light tells the cells in the retina that it is daylight, and therefore time to stay awake. This message is carried to the “inner clock” in the hypothalamus, and the inner clock tells the pineal gland to stop secreting the sleep hormone, melatonin. That can lead to insomnia. We have known for years about the danger bright light poses to adults who want a good night’s sleep. However, only recently has the effect of bright light on children been investigated. In a March 2018 study, researchers at the University of Colorado found that preschool children who were exposed to bright light an hour before bedtime suppressed their melatonin production by almost 90%. Even when the light was dimmed again, most children did not secret even 50% of their baseline level of melatonin. These results may inspire a closer look at the effects of light on preschool children, since we know that they are more sensitive to light than adults. Compared with adults, children have bigger pupils, and clearer lenses. As we age, pupils constrict, and the lens yellows, letting less light in; at around age 40, we begin to have the problems described in Why Seniors Have Sleep Problems and How To Fix Them. How can you safeguard your child’s sleep? Don’t expose your child to bright light for at least an hour before bedtime. Turn off the fluorescent lights in the kitchen. Reduce the general illumination. Install f.lux, a free app, on computers, and devices. In the evening, f.lux will filter out the blue section of the spectrum that suppresses the production of melatonin. Read more in When the Light You See is Not the Light You Want. Keep your child from looking directly at bright light at night. If you want to use night lights, place them near the floor so the light will not shine down into the children’s eyes, hitting the cells which carry messages to the inner clock. Better yet, get amber night lights, which have already filtered out the blue light. CET recommends, and sells, them here. Use curtains rather than blinds. Curtains can make a bedroom totally dark, which is ideal for sleeping. When necessary, wear protective glasses. If you are in an environment with a lot of light pollution, such as a mall, before your child’s bedtime, use eyewear that filters out blue light. CET carries protective eyewear for those who want fashion, fit, and the highest quality for children and adults. Much less expensive versions are available on Amazon, although – as far as I can tell – not in children’s sizes. Light, and our many electronic devices, are amazing. However, we need to safeguard our children from their unintended consequences on our circadian rhytms. Hoban R. Bedtime for Frances. (Illustrated Williams G.) New York: HarperCollins, 1960. Klass P. To help children sleep, go dark. The New York Times, March 5, 2018.